I awoke on my first day at the paradise beach project to the torrential rain that I have become accustomed to. Will it ever stop? We first walked to the soda, the community run café where we get our meals. And what meals they are. Delicious home cooking served with love from two local ladies, who express such an interest in us that it is touching. 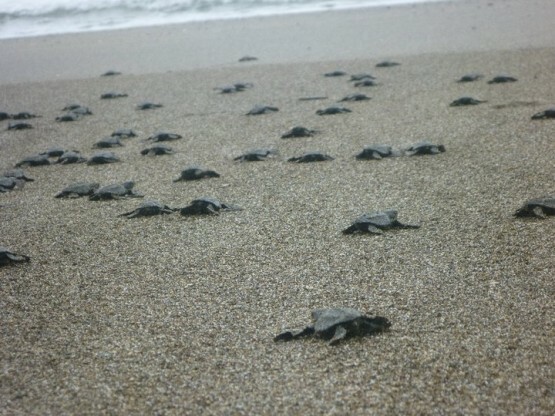 After breakfast, upon returning to the house and going to the hatchery, we found two hatched nests of 115 turtles. Putting the babies into buckets we took them back up the beach to the soda, and the ladies helped us to release them. They looked just like I felt- like a child who has just been given a brand new toy. I had been moved by just watching one baby turtle making its way to the sea- seeing 115 was just incredible. They moved in one huge wave, spreading out along the beach in their desperation to reach the sea quickly. Watching them tackle the waves is insane- I am still not sure how 115 baby turtles of about 6cm long managed to get past the barrage of Pacific waves and currents and out to sea. But every single last one of them did. After setting the turtles out into the big wide world we took a walk up the beach. It’s so much bigger than the previous beach, and we walked for about an hour until we reached cliffs with a rainforest seeming to cling to the vertical slopes. Three giant waterfalls cascaded down from the top of the steep rock face into the sea below. “This is the real Costa Rica,” Jeffrey had said. And he was quite right. The dense richness of the trees and plants, the water pouring down, the sound of howler monkeys in the jungle, the birds of prey soaring overhead- this was better than I had imagined. We walked home in silence, still in awe of the stunning sight that we had just witnessed. I was nervous about my first beach patrol. Were poachers like the smugglers I had read about in the Famous Five books when I was younger? Would they threaten us? How would they react to a foreigner invading their beach and telling them that, despite the fact it was their culture and their heritage, they were not allowed to take the turtle eggs? In all honesty I had no need to worry. The poachers that we encountered would stop and chat to us, making out that they were looking out for the eggs and wanting to help us. They are clever though- they do their best to cover up the turtle tracks, they use torches with red bulbs as they know that we do too, and they hover next to the turtles, staking their claim to the freshly laid eggs. And if they get there first, we just have to let them take them. It would be hard for anyone to know how heartbreaking it is to arrive at a nest that has already been poached. On our way back to the house at the end of our shift at 05.30, we saw immense tracks in the sand. Usually you can see the small indentations in the sand from where the turtles use their legs to lever themselves up the beach. These tracks were indented about one inch into the sand- the turtle that had made them was heavy. They were also symmetrical tracks, which meant that it wasn’t the type of turtle that we usually get here. Symmetrical tracks belong to the leatherback turtle, which is rare and enormous. Following the tracks with some anticipation we found an absolute beast of a turtle digging a nest beneath a palm tree. Its shell measured 110cm wide, as opposed to the average 65 – 70cm that I have previously seen. It was quite simply startling, if not a little intimidating by its sheer size and bulk. 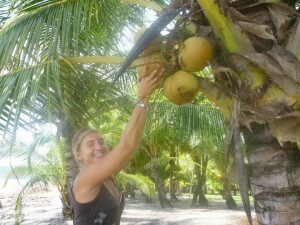 Unfortunately we did not get to see the eggs, which I maintain would have been the size of coconuts, as the roots of the palm prevented the beast from digging her nest, and so she manoeuvred herself around, and hauled herself back to the sea. We still have no idea what sort of turtle she was. All we know is that she should be back very soon to try again. I hope I am there to see that.